Investors get a big appetite for Noodles & Co.
Don’t look now, but Noodles & Co. is back on Wall Street’s radar. The Denver-based fast-casual noodle chain, which has had its ups and downs (mostly downs) in nearly five years as a public company, is having one of those “up” moments so far in 2018: Its stock is up more than 45% so far in 2018. That’s the best performance by a restaurant chain this year, at least one that isn’t being sold. That includes a nearly 3% jump on Monday, when, to be fair, everybody else jumped about 3% as the stock market regained some confidence. Still, Noodles’ jump comes as the chain has regained some footing under CEO Dave Boennighausen and Executive Chairman Paul Murphy—notably a 320-basis-point increase in restaurant margins in the last three months of 2017. While same-store sales declined 0.9%, that was a 260-basis-point improvement over the chain’s performance in the third quarter. For Noodles, the good news was a long time coming. The chain’s 2013 IPO was one of the hottest restaurant IPOs in history. The chain priced its offering at $18, well above the $14 to $16 it expected, and then saw demand skyrocket, with its price more than doubling on the first day of trading. 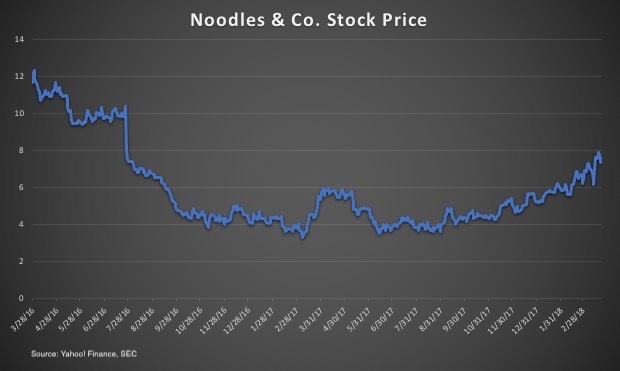 Noodles’ stock peaked at nearly $47 a share later that year, as investors hoped to get in early on a chain many felt would replicate the earlier success of Noodles’ neighbor, Chipotle. But generally mediocre same-store sales and weak profits left investors dissatisfied, and Noodles’ stock quickly fell out of favor. At one point last year it traded at $3.35 per share. Do the math, and that’s a loss of 93% of the company’s peak value. CEO Kevin Reddy stepped down in 2016, and Noodles brought aboard Murphy, who had helped turn around Del Taco, and made Boennighausen the permanent chief executive. It received investments from private-equity groups L Catterton and Mill Road Capital. The company closed underperforming locations, including 55 in the first quarter a year ago. It slowed unit growth. And it made significant menu changes, removing items such as sandwiches. The results are clearly pleasing investors that see the beginnings of a comeback. The stock has now more than doubled since it hit that low point. The stock hasn’t been at this point since July of 2016. It’s now trading at an enterprise value multiple of 13 times earnings before interest, taxes, depreciation and amortization, or EBITDA, which is lower than many other limited-service chains on the public markets but is not a bad valuation. Of course, the stock would need to double again, and then keep increasing after that, to reach its post-IPO euphoria. Noodles also has to generate sales and traffic if it is to be the growth chain it promised investors five years ago. The chain’s limited menu of carb-heavy products could make that difficult.